For students waiting to hear back about college acceptances, there are not many avenues to adequately determine admissions chances before decision arrive in late March. Recently, though, high school students have become more creative and even prescient in their efforts to judge their admissions chances early on in the application process. This admissions sorcery is the world of ‘chance me’ threads on College Confidential, a website used by high school to seek advice and input on the college admissions process. The premise for the ‘chance me’ thread is simple: a high school student will post his respective statistics (GPA, test scores, etc. ), interests, or clubs, and seeks his chances of admission to a particular school from members of the CC community. The student must present enough information for respondents to have an accurate image of their profile, but not quite enough to be identified by those who truly know them. With such a cautionary statement, one would think that the replies to ‘chance me’ requests would be brief and straightforward. You are applying to Yale, Stanford, and Harvard, great choices. You have a 6.7, 5.7 and 5.8 percent chance respectively of being accepted at each school. But the world of ‘chance me’ threads is never that simple or polite. The ‘chance me’ threads are a world where indifference and insincerity bound neatly together. Not all the content on CC—such as the test preparation material and discussions on different scholarship—is necessarily degenerate, but the ‘chance me’ thread highlights the best of internet trolls. One user seeking his chances wrote “I don't feel like going into detail with all of my EC's but they are pretty good.” Taking his word, CC writers would grant him a 23 percent chance of admissions at any college of your choice. As far as SAT scores go, some CC regulars say that you should absolutely retake the test if you received a 2400 but an 11 on the essay, because colleges don’t want to accept a lousy writer. 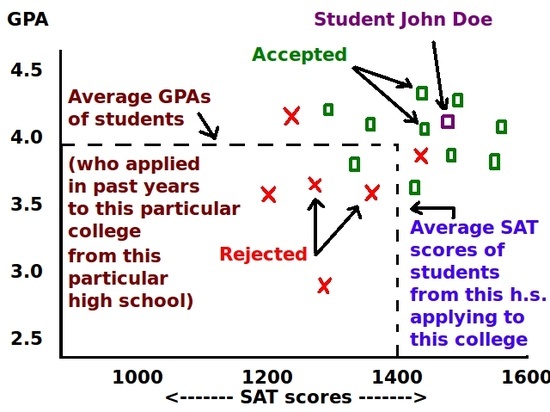 And if you don’t have a perfect score to begin with, you are out of luck, since one user wrote that the average SAT for Princeton is closer to 2400. ‘Chance me’ threads offer an outlet for anxiety, but a means for increased frustration. The world of college admissions is tricky and confusing, and the ‘chance me’ thread does not often help in separating fact from fiction. That email in March will, though.